In southeast Ohio there is a small section of land called the Hanging Rock Region. What makes this area remarkable is that it contains rich deposits of iron ore, limestone and lots of large trees: all the raw ingredients needed during the 1800s to produce iron. While this was a short lived era in Ohio's industrial age, the area played a critical role in the development of the state and the nation. 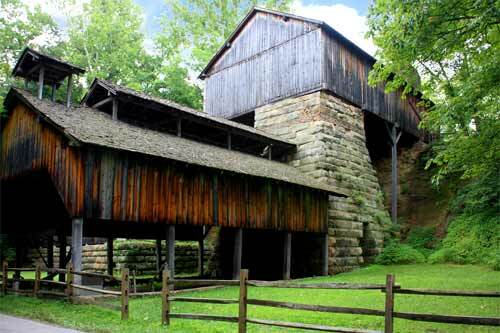 The first iron furnace in Hanging Rock Region was built in 1826. Thirty years later there were 65 furnaces producing iron ingots. This iron was used not only in Ohio, but throughout the country when the demand for pig iron skyrocketed with the introduction of the steam locomotives and the vast quantities of iron rails that were being constructed throughout the state. From the onset of the Civil War, demand for iron grew even more. In fact, it was iron produced from the Hanging Rock Region that was used to construct the Union's first iron war ship: the Monitor. After the war, new iron processes were developed and new reserves were discovered. Railroads and shipping made it possible for these new resources to be shipped economically to iron and steel production centers such as Pittsburgh. By the end of World War I, all of the Ohio furnaces had closed and were abandoned. Today there are still a few reminders of these once thriving businesses usually in the form of a stone furnace stack. Today's visitors can seek these remnants out, but it is difficult to imagine exactly how they operated or how large they actually were, unless you happen to find one that has been restored, which is not easy. In fact there are possibly only 3 of these restored furnaces in the country today. One of them is in southern Ohio near Wellston. Buckeye Furnace was built in 1851 by Thomas Price and at it's peak production it could produce 12 tons of pig iron a day. It ceased operations in 1894. The Buckeye Furnace site was rebuilt in 1972 under supervision by the Ohio Historical Society. 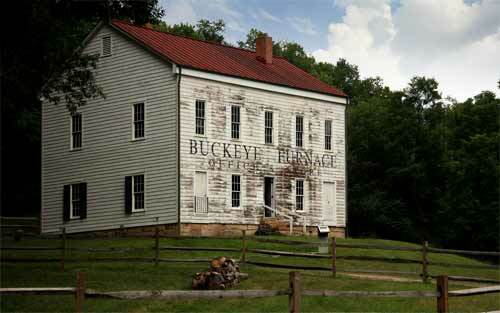 In 2007, Buckeye Furnace held a grand re-opening with the first Buckeye Furnace Fall Festival under the direction of Friends of Buckeye Furnace which now operates the museum. The Museum / General Store has been reconstructed according to the actual plans of the original and today it contains a wealth of historical items related to the era of the large iron furnaces. 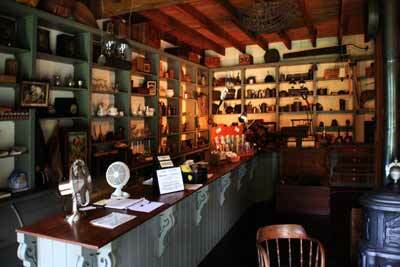 Also a number of novelties are available in the Gift Store including replicas of pig iron ingots. There are some 270 acres to the site and the museum is open weekends from 12:00 p.m. - 5:00 p.m. Buckeye Furnace is located 10 miles east of Jackson and 2 miles south of SR 124.